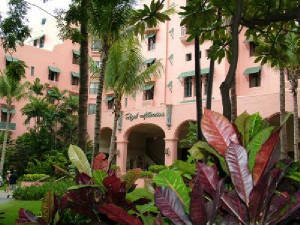 The Royal Hawaiian Hotel is an incredible architectgural building as well as historic spot in Honolulu, Hawaii. It has long has had ties to Hollywood from early visits by Mary Pickford and Douglas Fairbanks through Mary Pickford to Joe Dimaggio and Marilyn Monroe through Elizabeth Taylor. Fox Studio even had the Charlie Chan entry The Black Camel (1931) partially shot there (http://www.youtube.com/watch?v=YtLsPlHL9-s). For centuries, the land beneath the Royal Hawaiian Hotel, Helumoa, has been an mportant place to Hawaiians. It was the stage where royal courts ruled, the supernatural appeared, an invading army landed and where royalty lived and relaxed. Maililkukahi, ruler of Oahu, relocated the seat of government from the ewa plains of Oahu to Waikiki as the royal seat of government. Kakuhihewa, Maililkukahi's descendent six generations later encountered the supernatural rooster, "Kaauhelemoa" who flew from Palolo valley and landed at Waikiki to challenge Kakuhihewa by scratching the ground, according to legend. The place was then named "Helumoa" which means "chicken scratch." Kamehameha V also built a residence at Helumoa (pictured, left). After his death, Helumoa was left to Princess Ruth Ke'elikolani, who bequeathed it to Princess Bernice Pauahi Bishop. Through Princess Pauahi's will, the land became a part of Kamehameha Schools (Bishop Estate), which still owns the land today. Kakuhihewa felt that the appearance of the supernatural rooster was an omen, so he planted a grove of trees, which later multiplied into an estimated 10,000 coconut trees. King Kamehameha I, ruler of the Hawaiian Kingdom, established a home named "Kuihelani" in the Helumoa coconut grove. In the 1890s, the property was leased as a seaside annex to the Royal Hawaiian Hotel located at Richards and Hotel streets. In 1907, the Seaside Hotel opened on the property, and was later acquired by Alexander Young's Territorial Hotel Company, which operated the Alexander Young hotel in downtown Honolulu. King Kamehameha V's residence at Helumoa. In 1924, the Seaside Hotel's lease of the land at Helumoa was soon to expire and the land's owners put out a request for proposals to build a hotel, with a minimum construction cost of $100,000, that would better capitalize on the ideal setting. The offer: a 50-year lease of 3.75 acres of beach front land on Waikiki Beach. Incorporating additional surrounding land was also an option extended to potential developers. In post World War I Hawaii, Matson Navigation Co. had big plans to build luxury ocean liners to bring wealthy tourists to Hawaii. But, they needed a hotel equally lavish at Waikiki. Soon Matson's luxury ocean liner and its 650 wealthy passengers would be arriving in Honolulu every two weeks and the two largest hotels, the Alexander Hotel and the Moana, could not accommodate all of them. 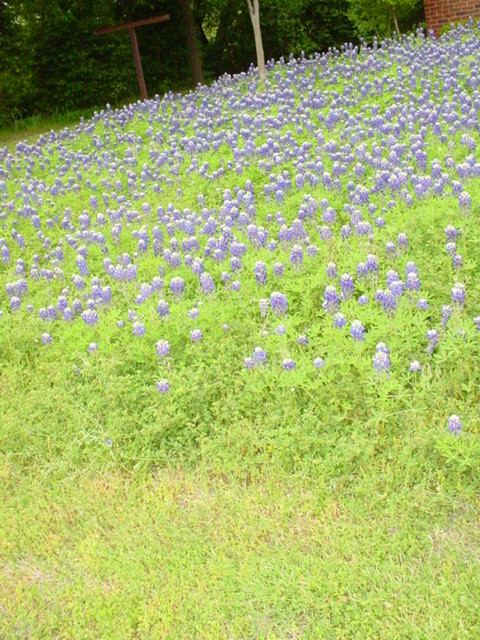 The availability of the Bishop Estate land began putting wheels into motion. In March 1925, William Roth, Manager of Matson Navigation Company, and his wife Lurline (who's maiden name was Matson), and Mrs. William Matson, the widow of the founder of Matson Navigation Company, arrived in Honolulu for a three-week stay so that Roth could attend the annual Matson conference. Famous New York-based architect Charles V. Wetmore also arrived in Honolulu at the invitation of Matson Navigation Company leadership. Wetmore advised Matson Navigation that "Honolulu is one of the wonder spots of the world, and it should have a hotel that is as much of an attraction as the city itself." Castle & Cooke, Matson Navigation and the Territorial Hotel Company successfully proposed a plan to to build a luxury hotel, with 400 rooms, at a cost of $2 million on the 15-acre parcel of Waikiki beach to be leased from the Bishop Estate. Warren & Wetmore, who were known for their other hotels including NYC's Ritz-Carlton, Biltmore, Belmont, Vanderbilt and Chatham hotels, were selected as the architects. The building permit still was not signed by August, and the City withheld granting it unless the building codes were first revised. The planning commission did not want to revise the building code to allow high rises on Waikiki beach. The City and County Board of Supervisors disregarded their concerns and allowed the increase in heights. This would forever change the landscape of Waikiki, as the decision also allowed much taller highrises to be built in the area. On February 1, 1927, the Royal Hawaiian was officially opened with the gala event of the decade. Over 1200 guest were invited for the celebration that started at 6:30 p.m. and lasted until 2 a.m. It was the twenties, after all. Three bands played that evening: The Royal Hawaiian Band, the The Royal Hawaiian Concert Orchestra and the nine-piece McCabe-Dunn Royal Hawaiian Dance Orchestra. The most unforgettable part of the evening was the recreation of the landing of Kamehameha I's landing at Waikiki, directed by Princess Kawananakoa. The Royal Hawaiian was THE place to stay from that night on and her doors greeted world leaders (President & Mrs. Roosevelt, the Shah of Iran), business leaders (Rockefeller, Ford, DuPont) and Movie Stars (Clark Gable, Bing Crosby, Shirley Temple, Mary Pickford, Douglas Fairbanks, George Burns, Gracie Allen). The party ended rapidly on December 7, 1941 when Pearl Harbor was attacked launching the U.S. into World War II, and putting Hawaii under martial law and blackout measures. In January of 1942, the U.S. Navy signed a lease agreement with the Royal Hawaiian to rent the hotel for $17,500 each month so that the hotel could be used as a rest and relaxation center for officers and enlisted personnel serving in the Pacific. And so the barbed wire surrounded the beach around the hotel and armed guards monitored the entrances. Retail shops were converted to canteens and the Coconut Bar was used as a soda fountain. Telephones were taken out of the guest rooms. 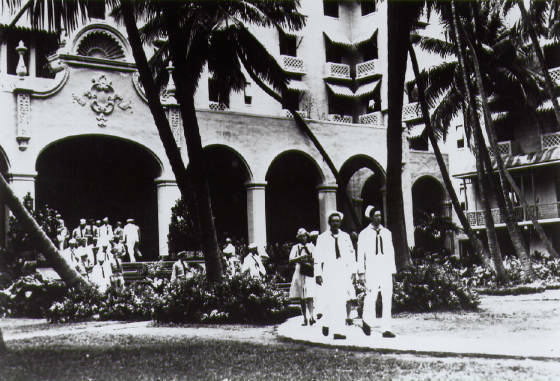 During the war, over 200,000 men stayed at the Royal Hawaiian. Each day as many as 5,500 service-related visitors (most of whom were not staying at the hotel) passed through the front gates to enjoy the beach or social activities. At the conclusion of World War II, the hotel was given a makeover to restore her to the level of luxury her guests would expect. San Francisco architect Garnder Dailey was contracted for the two-million dollar remodeling along with Honolulu architect George Wimberly. Built in 1927, the iconic Royal Hawaiian Resort, known as the "Pink Palace of the Pacific," ushered in a new era of luxurious resort travel to Hawaii. Located on breathtaking Waikiki beachfront, the Royal Hawaiian is an exclusive enclave for luxury and romance. We invite you to experience the new Royal through our online video (click on the image to the right). The most coveted spot on Waikiki Beach is at the Royal Hawaiian Resort - within the billowing sanctuary of private beachfront cabanas or from luxurious guest rooms showcasing unrivaled panoramic views of Diamond Head, Waikiki Beach and the sparkling Pacific Ocean. Unforgettable epicurean experiences await you at Azure – a world-class seafood restaurant perched along the beach under the canopy of the resort’s dramatic architecture. The celebrated Mai Tai Bar sets the stage for world-class romance and elegant relaxation. Mingle with international jetsetters and Hawaii elite while sipping in refreshing cocktails and contemplating the breathtaking panorama of Waikiki Beach. 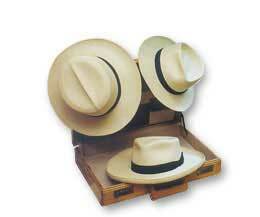 Check out Newts at the Royal for Panamas just like Charlie Chan wears at http://www.newtattheroyal.com/!